The same grace that saves you, grows you. The same gift that lifted you out of the depths of the lost wilderness will guide through the narrow mountain pass. The journey begins with grace, continues with grace and will end with grace. Our works can not and do not build a bridge to heaven. They are simply the evidence of God’s grace in us and as well as the gifts we get to give others on our way to eternity. Respond to others with God’s grace. Rest completely in God’s grace. Grace will take you where works never can and do more than your best efforts ever can. Give grace room to work in you and give grace room to work in those around you. Let God be God and give His grace lots of room to move. 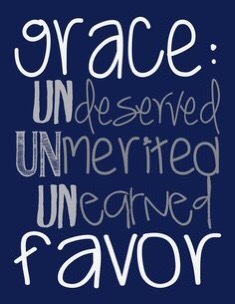 When in doubt, give grace.